Here's a series of play sets that won't be debuting in the toy aisle anytime soon. 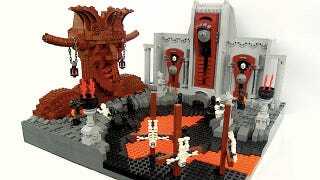 Sculptor Mihai Mihu has built this fantastic and creepy nine-part collection of LEGO dioramas based on Dante Alighieri's Inferno. Witness the Divine Comedy depicted in tiny plastic bricks, from the River Styx to the frozen head of Satan. According to Mihu, this entire project took seven months and includes such horrendous embellishments as the man-eating landscape of Gluttony and the living walls of Greed. With regards to the punishments, there's some creative license on display here, but it's still enough to give you the heebie-jeebies. If LEGO bricks ever had the power to cause nightmares, just look to the menstrual river of Lust. Yikes. NOTE: Rather than slap the entire article not safe for work because of a few LEGO portrayals of stone genitalia, here's a link to the uncensored photos. Bask in the plastic brick phalluses and whatnot. You can see more photos of these soul-rending dioramas at Mihu's Flickr account.